I know you read that title and are now thinking, “oh brother,” but bear with me and try to examine this with new eyes as we contemplate the hiring of Mark Helfrich as Offensive Coordinator and Quarterbacks Coach of the Chicago Bears. I truly believe he will be the Blockbuster Sleeper hire of the NFL this year, and will fare better than Chip Kelly in the big leagues. First of all, there is no need to re-hash everything about why Helfrich was fired as head coach at Oregon; I know the story–we all know the story, as we all lived through it. However for the Chicago fans who may read this, it comes down to a couple areas of weakness; the biggest being how Helfrich was unable to command leadership over 100 players. He was also not a strong recruiter, and his ultimate downfall in Eugene was likely a result of poor hirings on the defensive side of the ball. Now that we have that covered … no need to digress or comment on that further. The rest of this article examines why Helfrich will succeed in the Windy City. Coach Helfrich was a nice guy, probably too nice for managing a full team of 18-22 year olds, but ideal in small group situations such as teaching quarterbacks (particularly when those quarterbacks are men, not boys). 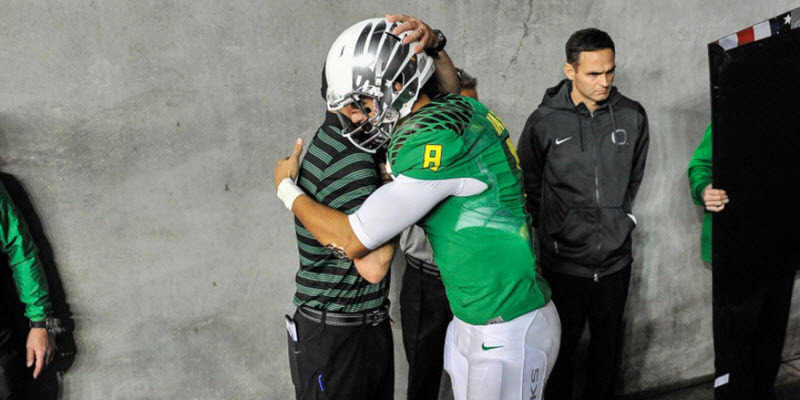 Look at the photo above in the tunnel before the 2014 Pac-12 Championship, as Helfrich was bear-hugged by Marcus Mariota, who was so grateful to the coach for his development. Marcus swears by Coach Helfrich, and that ability to be close and caring to a quarterback is going to help Mark work with quarterback Mitch Trubisky in Chicago. The most important player on a football team needs a “go-to” and unique relationship with his position coach, and Mark will not try to be “cool” or aloof. He will be there for his quarterbacks and truly prepare them well for games, and have their backs. Mark is not prideful; he is a giving soul who will communicate on a complex level necessary for current NFL offensive attacks. As you recall, Mark was accepted to two medical schools before deciding to coach; he is very smart, and certainly Chip Kelly would not offer him a college OC role twice (Oregon, and recently at UCLA) without a healthy respect for that intellect. Chip doesn’t suffer fools well, and only surrounds himself with those who can challenge his notions and improve upon them. Usually someone like Mark who is this brilliant with the Xs and Os has a massive ego of his own, and finds working for a head coach with a similar ego to be challenging. 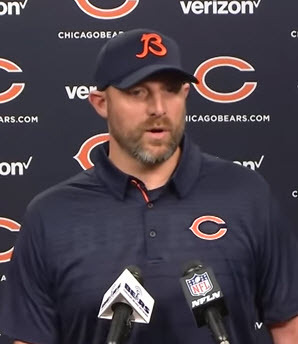 I sense that head coach Matt Nagy of the Bears doesn’t quite have the Kelly ego, and thus he and Helfrich can collaborate easily. Having a smart OC who can design game plans and suggest plays for a HC and have the strength to allow for input/changes from the HC is a very valuable asset for any NFL organization. Why did Mark not join Chip with the Bruins? 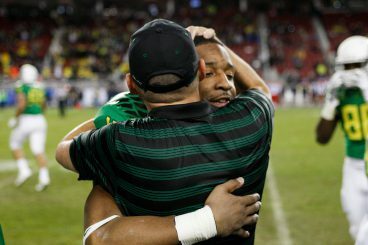 First, I look skyward and say “thanks” for not having them together in the conference again, and I think Mark knows how tough it might be to bring Kelly along with the upgrades and improvements Helfrich made to the Oregon Spread “Zone-Read” offense. Chip is pretty stubborn and has to lose enough games to change, while Mark may not want to go through that again. Plus, Chip has had his fling in the NFL; Mark understandably wants to take his shot. This is a great match-up for all parties, as the Bears are a mess on offense and Coach Helfrich can help to elevate. 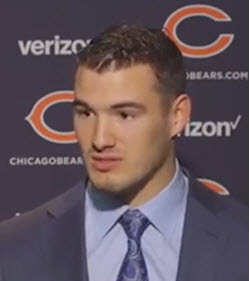 Mitch Trubisky was the second pick of the draft last year and gritted through a tough rookie year. However, he is primo for what Helfrich wants for an NFL offense; this is a 6’3″ young gun with a huge arm who runs a 4.60 forty-yard dash. He is specimen; a passer with high upside, and enough speed to scramble on broken plays, and make a few Zone-Read first downs? Perfect (sounds like a current Oregon QB we know…). Chip Kelly virtually handicapped his own offense in the NFL by having statues at QB in Nick Foles and Sam Bradford. Every DC knew these QBs were not going to pull the ball and run for a first down. Chip telegraphed his plays in advance with formations, and effectively moved to the opposite of where Helfrich was taking the Oregon offense back in Eugene. Trubisky has the arm, the smarts, the poise, and speed to be a tremendous quarterback in the NFL, and Helfrich can develop that with the blended offense he’ll be introducing and integrating with the Bears. Unlike Chip, who told the world what he was running in advance with his use of formations, Mark altered that and went to multiple formations and motion to disguise the basic plays of the Oregon blur offense. Like Joe Gibbs with the Washington Redskins years ago–who essentially ran three plays from many formations–it was simple for the Duck players on offense, but difficult for teams to prepare for and defend. What Helfrich detractors must accept: Chip’s offense stagnated in the NFL, but the Oregon offense continued to evolve after Kelly left. 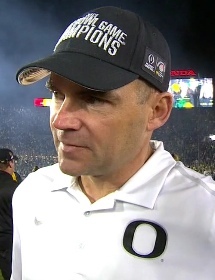 The Oregon offense was in the top five of the entire nation for scoring and rushing for a five-year period from 2011-2015, and the one constant was Mark Helfrich. Yet even Mark balanced out the offense with more passing when given a quarterback with the abilities of Marcus Mariota. I expect to see some Zone-Read from the Bears, and without giving another lesson on it, remember the primary objective of the Zone-Read. When a player is “read” on one side, that means he is not blocked, hence all the blocking assignments shift over one position to the playside. Thus, the offense now has an extra blocker on playside, with hat-on-hat blocking. The free safety is not free, and with good blocking the running back can make one defender miss and create an explosive play. Chip always said that he did not want quarterbacks to run; he wanted his running backs to run the ball. He wanted the defender being read to “sit” so the offense had the extra blocker on the playside. Chip wanted to run a Zone-Read offense complimented by an NFL offense; I see Helfrich doing the opposite and running an NFL offense complimented by an occasional Zone-Read. In the rare instance the QB pulls the ball? He is running down the backside of the defense in open field and can slide easily when approached. This is not running the QB between the tackles. Coach Helfrich would have some “ancient” plays in the playbook pulled out for each game at critical junctures. In 2014 against the damn Huskies, it was 2nd and goal on the five yard line against a defense that had five future NFL players. I recall wondering “what does he call?” The next play scored and as people cheered around me, I shook my head in disbelief; that scoring play had not been used since 2010! How can an opposing defense prepare for that? I have more examples of Mark’s Xs and Os, but we’re running long and we have so much in the new Analysis Library just added to FishDuck.com, with more analyses to be augmented to this new part of the site over time. Take time to go in and look at the incredible collection of information about the Oregon offense over the years; one can learn a ton of football from over 300 analyses. I wish it had worked out at Oregon for Mark Helfrich, but I wish him well knowing that he is going to do superb work for the Chicago Bears, and it will be fun to watch the progression of that team.